The seat warmer is provided to warm the rear outboard seats during cold weather. With the ignition switch in the ON position, push either of the switches to warm rear seats. 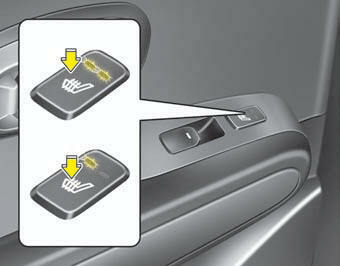 When pressing the switch for more than 1.5 seconds with the seat warmer operating, the seat warmer will turn OFF. The seat warmer defaults to the OFF position whenever the engine start/stop button (the ignition switch) is turned on. Be careful not to spill liquid such as water or beverages on the seat. If you spill some liquid, wipe the seat with a dry towel. Before using the seat warmer, dry the seat completely.